Ribe-eye* Galician Beef for two, 500 g.
Steak Tartar of Galician Beef 150 g.
Homemade Burguer with Galician* Beef 200g. with gourmet lettuce, Gorgonzola cream, chutney of tomatoes and onion, with crispy bacon. Even if you believe in superstitions, in Madrid there is a space capable of stopping them. It&#039;s called Martes 13, spanish date synonymous of bad luck; and the name does not scare you. Here you have the luck to taste a traditional renovated kitchen that will not leave you indifferent. Mixing art and cuisine in a relaxed atmosphere full of color and surrounded by original portraits inspired by Alice in Wonderland, it is an informal space where any meal becomes an unforgettable memory. As part of its offer, you will find dishes so beguiling as boletus with foie gras, black pudding croquettes with peppers, etc. They also have an attractive terrace to enjoy the good weather. Dare to enjoy the original proposal Martes 13 has prepared for you, you will not regret! No payment is allowed with ticket/check restaurant for services with promotions. Invalid promotion for sandwiches or half portions. Car park Täch Hotel Madrid Airport, 3 min. Servicio lento entre planto y plato. El resto excelente. Los platos son muy originales y muy bien atendido. Ambiente tranquilo. Nos ha gustado mucho . A very nice place to go and have dinner! 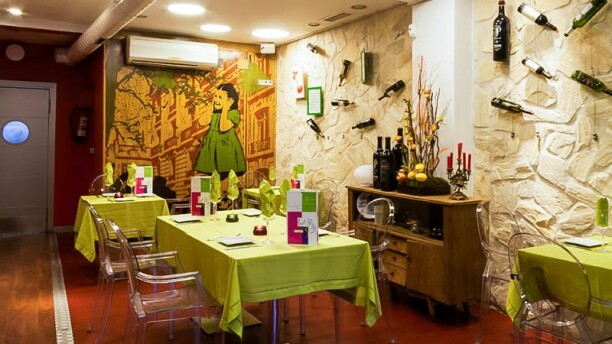 This is a small restaurant in Barajas. The reception was fast and we were informed that our reservation was not in because I had done that 1 hour before the arrival time, but we were accommodated immediately. We were also informed on the discount I had with this booking through the Fork and the conditions for the discount. I enjoyed the experience, and so did my friends invited to dine with me. I would certainly repeat this experience. Muchas gracias por su opinión, que para nosotros es herramienta fundamental para nuestros procesos de mejora. No encantaría volver a contar con usted en una próxima visita. Nice gourmet experience, two steps from Madrid airport.